Fatgirl Hedonist: Sprung Beer Festival and Grillin In The Grove Festival Ticket Giveaway! Sprung Beer Festival and Grillin In The Grove Festival Ticket Giveaway! Sprung Beer Festival is BACK! That spring time beer wonderland will be arriving at Peacock Park in Coconut Grove on March 7, 2015 with over 150 craft beers to choose from. La borrachera y gosadera will be on HIGH with plenty of bar games, food and live music. Among the 200+ beers being offered, there will also be a complete lineup of Florida beers from Schnebly, Cigar City, Tequesta Brewing and Florida Beer, along with 305 breweries such as Hialeah Brewing, Funky Buddha, Wynwood Brewing, and M.I.A. Beer fans will also be treated to a selection not available in South Florida, and in keeping with tradition, the homebrew section will showcase brews created by locals who are passionate about their beer. Tickets for this beer pachanga run between $40 for General Admission and $90 for VIP. Luckily for you, I'm here to hook you up with a pair of tickets. If you don't want to gamble on a giveaway, you can buy your tickets here. Obviously, participants for this giveaway MUST BE AT LEAST 21 YEARS OF AGE! In addition to a pair of VIP tickets to Sprung Beer Festival, I'm hooking you up with a pair of VIP tickets to Grillin On The Grove. 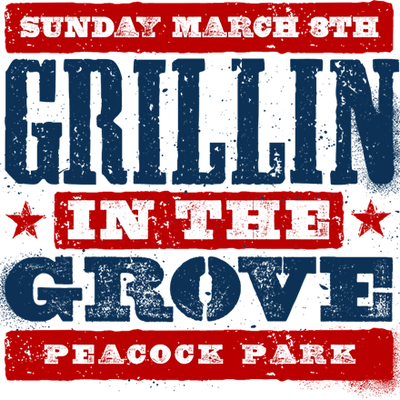 The same folks bringing you the Sprung Beer Festival are also coordinating the best hangover cure imaginable, Grillin In The Grove. It's a barbecue festival and it's happening the very next day after Sprung Beer Fest on March 8, 2015 at Peacock Park. Coincidence? I think not. The BBQ feast will be a a family friendly event with activities for all ages, will tempt your taste buds with a myriad of BBQ offerings ranging from American styles to international. Families are encourages to bring some lawn chairs and blankets as this is set to be Miami's largest backyard barbecue. In addition to BBQ food, there will also be a couple of food competitions going on. There will be competitions for the titles of Best Backyard Burger and Greatest Grill. Judges will include local bloggers such as, Burger Beast. Tickets for this event start at $15 for General Admission. However, VIP is where it's at and for only $65 it's a great deal. The VIP BBQ Experience includes access to VIP Bar Complimentary Beer bar, complimentary BBQ plates featuring Memphis style pulled pork, Texas ribs, BBQ wings and plenty more. For a full breakdown of what each ticket buys you and to buy tickets, click here. Winners will be selected on March 6, 2015 and again, ALL PARTICIPANTS MUST BE 21 AND OVER! Anything Funky Buddha with a Nice Rack of Beef Ribs! Wynwood Samoa and pulled pork!!!!! Wynwood Samoa and pulled pork!!! Favorite craft beer (at the moment): Hazelnut Coffee Imperial Sweet Stout brewed by J Wakefield Brewing. Good ol' smoky BBQ burgers would be my go to BBQ dish. Pair it with a nice craft brew like Lagunitas Little Sumpin' Sumpin' and I'm set. Junt by Memphis Made and BBQ Brisket. Pork & Beer. What more can a Hialeah chonga ask for?! Dogfish Head 90min and burnt ends!!!! Golden Monkey - Victory Brewing Company with a good ol' fashion pulled-pork sandwich from Sparky's in downtown MIA! Doc's hard apple cider with ribs and grilled corn! Perfection!!! Sierra Nevada pale ale with chicken wings!! Sierra navada pale ale with chick wings!! Hungry and Thirsty! Not specifically in that order!!! Baby Back Ribs & Innis & Gunn Whiskey Cask. Or ANYTHING from Funky Buddah. My favorite craft beer is currently Wide Awake It's Morning by Funky Buddha, but it changes often.